Things change. Responsibilities creep into our lives and compromises need to be made. What may once have been an unwavering tenet of your gaming life may now be something that needs to change for the sake of the greater good. The gaming room, or 'office', may now have to shelter children or perform some other mundane task, which means that your giant, pimped-out desktop gaming rig may have to give way to a gaming laptop. 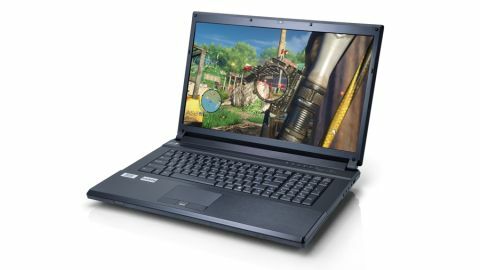 A gaming laptop like this wee offering from PC Specialist. We say 'wee', but let's face it, measuring over 17 inches in diagonal and weighing 4kg is anything but small. This is a desktop replacement. In fact, the inclusion of a battery is just in case the power in your house goes; it's not going to do anything useful in a machine of this size. So let's largely ignore the fact it packs a 5,200mAh battery, and not get too excited about the three hours of stamina if you do accidentally fall over the lead and unplug it - it's a nice feature, but you're going to have this machine plugged in most of the time. So, it's heavy and huge. Why should you consider it? Basically, because it's incredibly powerful. While there are plenty of machines that aspire to gaming, the Vortex III actually backs up this notion with some real gaming-capable hardware. You'll find a proper Core i7 processor doing the hard work, and a GeForce GTX 680M providing the all-important gaming grunt. This is a mobile graphics unit though, so don't get too carried away with the name. The core configuration more closely resembles the GeForce GTX 670, albeit with a much slower core operating speed. Even so, this graphics core is pretty much as good as it currently gets for single-GPU mobile polygon-pushing, and it's great to see it here, powering a decent quality 1080p display. On the storage side of things, you'll find PC Specialist has done the sensible thing of pairing a capacious 1TB Western Digital hard drive with a 120GB Kingston HyperX. We would have loved a slightly bigger SSD, but given the thoroughly reasonable price tag, we think this is a wise combo. You can always specify something a bit bigger when you're buying it on the website. All this hardware comes together nicely when gaming. The native 1080p resolution can be a bit of a strain at times but the likes of Max Payne 3 and Sleeping Dogs are playable with everything maxed out. There's always the option of turning off a few features if necessary. Unfortunately, there's still a fundamental problem with gaming laptops, and that's they're simply not as powerful as their bulkier, desktop-based siblings. By way of example, we tried the latest Hawken beta on this system and it was unplayable at even low resolutions. This problem is undoubtedly an issue with the beta, but an issue all the same. The same game on a similarly priced desktop ran buttery-smooth at 1080p. It may be a one-off problem, but it shows that desktops still have the edge for now.